Target all visible signs of aging and quench dry skin with this ultra-rich moisturizer that includes a blend of peptides, antioxidants and skin brighteners. Includes Multi-Performance Peptides, Pineapple Ceramide and Chilean Boldo Tree Extract. This product is definitely not worth the excessive price. First ingredient is WATER. I use this product at night. It is a very rich moisturizer which at 63 years of age I need. I love the fact that it has a blend of peptides. However, I do think it is overpriced and you have to use more than just a pee size as they state in their information. I probably have to use 5 pee size scoops of the product. It is a nice product though. I really like this moisturizer. It smells like melons to my nose, doesn't take a lot, it absorbs quickly....however after it's dried a sufficient time, say 4-5 minutes and I apply a sunscreen, the moisturizer rolls up and falls into the sink. It's the oddest thing. I've used 2 different sunscreens, both mineral, and it does it on both of them. If I use CC Cream, which is also mineral, it doesn't do this. One of the sunscreens I've tried is the Hydropeptides mineral sunscreen, so it makes no sense to me. This is a great nighttime moisturizer, however for the reasons mentioned, I wouldn't recommend this for daytime use under a sunscreen. I use this at night because it is a little heavier than most of my creams I wear in the day. However this just feels great, smells great and stays on my skin. It helps with discoloration and makes your skin feel really soft the next day. I love this moisturizer. You only need about a 1/4 size of a pea. It soaks in fast and doesn't cause breakouts or make my skin feel greasy. This is the only moisturizer my sensitive, combination skin will tolerate. I use it every AM with the line reducing serum. Ahh-mazing! for years, I have been using an extremely expensive moisturizer and it had out-priced my budget. This product (product line) was highly recommended to me by a skin specialist and was much more reasonably priced. I have used this product for about four months and I find it a very good moisturizer. And I am very happy to be paying about half of what I was paying previously. I became acquainted with HydroPeptide products at a spa. The facial was fabulous! 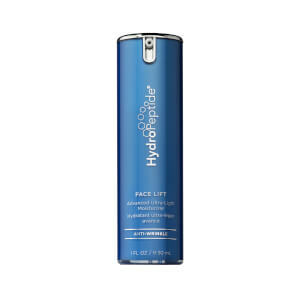 I love the product and intend to switch completely over to HydroPeptide. The Power Lift moisturizer is the best I have ever used and I truly see a difference in my skin texture and firmness already. I so wanted this product to be ok for my skin because it works! I've never seen such dramatic results. In only a few weeks it started diminishing fine lines, calming the redness in my skin and fading sun damage. But for me it also broke me out. I wanted so much for it to work that I stopped using it three times to let my skin calm and try again. Day one would be fine, day two I'd start two see pimple type things and by day three I'd be rashy. If you don't have sensitive skin I'd highly recommend it. I react to most things so I'm not surprised. I just received this product yesterday. I had previously tried a small amount of a sample of this product, (in miniscule amounts, trying to make the sample last) but that did not prepare me for the real thing.I am in my mid-50s, and don't really have a lot of wrinkles, but what I do have are pretty severe. Due to pain from chronic illness, over the years I have developed two very deep vertical lines between my eyebrows, and I have deep lines from the sides of my nose down to my mouth. To a lesser degree, I also have "smoker's wrinkles" above my top lip. Well, I used this product last night, and again this morning before my morning nap. When I woke up, I glanced in the mirror and was amazed to see that those deep creases between my brows were now barely denting the skin; just two lines with almost no depth at all. And the bottom 20% of the "nose to mouth" lines were gone. And this was after only 2 applications!I know that it is unlikely that everyone will get noticeable results this quicklly, but it just has me over the moon! I admit that the price threw me at first, but now I think it was worth every penny and then some. It is the most incredible skin care product I have ever used. I hope everyone who tries it has the same wonderful results as I am getting!